President Donald Trump, Governor Jerry Brown and Governor-elect Gavin Newsom put politics aside as they visited Butte County Saturday where they acknowledged California’s Camp Fire damage. Melissa Colorado reports. President Donald Trump on Saturday acknowledged Californians suffering from twin tragedies, walking through the ashes of a mobile home and RV park in a small northern town all but destroyed by deadly wildfires and privately consoling people grieving after a mass shooting at a popular college bar outside Los Angeles. "This has been a tough day when you look at all of the death from one place to the next," Trump said before flying back to Washington. Trump's visits to areas of Northern and Southern California in the aftermath of unprecedented wildfires that have killed more than 70 people gave him what he sought in flying coast to coast and back in a single day — a grasp of the desolation in the heart of California's killer wildfires. "We've never seen anything like this in California, we've never seen anything like this yet. It's like total devastation," Trump said as he stood amid the ruins of Paradise, burned to the ground by a wildfire the president called "this monster." Before returning to Washington, Trump met briefly at an airport hangar with families and first responders touched by the shooting at the Borderline Bar & Grill in Thousand Oaks more than a week ago, which left 12 dead in what Trump called "a horrible, horrible event." Reporters and photographers were not allowed to accompany the president to the session, which Trump later described as emotional. "What can you say other than it's so sad to see. These are great people. 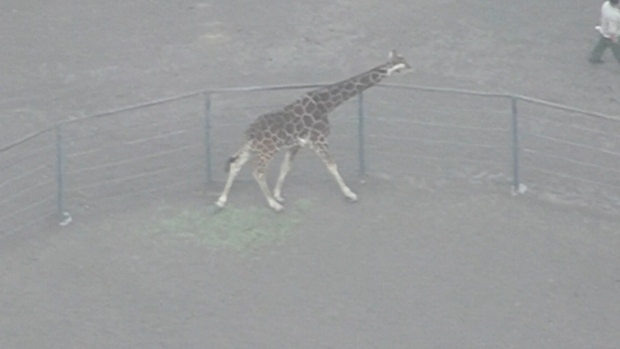 Great families, torn apart," he told reporters. "We just hugged them and we kissed them — and everybody. And it was very warm." Trump had made only one previous trip as president to California, a deeply Democratic and liberal state that he has blamed for a pair of overheated crises, illegal immigration and voter fraud. He also has been at odds with the state's Democratic-led government, but differences were generally put aside as Gov. Jerry Brown and Gov.-elect Gavin Newsom joined Trump in surveying the wildfire damage. "We're going to have to work quickly," Trump said near the crumpled foundations of Paradise homes and twisted steel of melted cars. "Hopefully this is going to be the last of these because this was a really, really bad one." In a nod to his belief — not shared by all forest scientists — that improved forest management practices will diminish future risks, Trump added: "I think everybody's seen the light and I don't think we'll have this again to this extent." With that bold and perhaps unlikely prediction, Trump evoked his initial tweeted reaction to the fire, the worst in the state's history, in which he seemed to blame local officials and threatened to take away federal funding. At least 76 people died across Northern California, and authorities are trying to locate more than 1,200 people, though not all are believed missing. More than 5,600 fire personnel were battling the blaze that covered 149,000 acres and was about 55 percent contained, officials said. 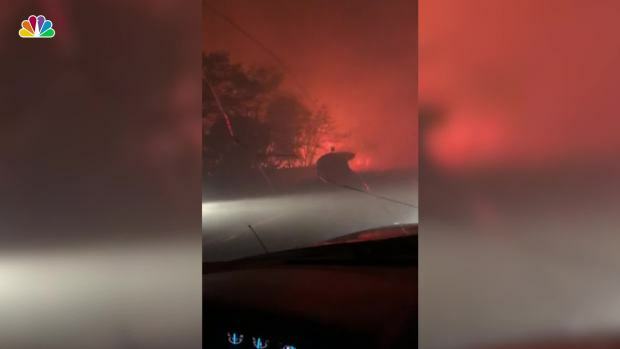 The Camp Fire in Butte County is the deadliest in the country in at least a century. Butte County Sheriff Kory Honea said authorities have tentatively identified 63 of the 76 dead. When asked in Paradise if seeing the historic devastation, which stretched for miles and left neighborhoods destroyed and fields scorched, altered his opinion on climate change, Trump answered, "No." The president has long voiced skepticism about man's impact on the climate and has been reluctant to assign blame to a warming earth for the increase in the frequency and intensity of natural disasters. 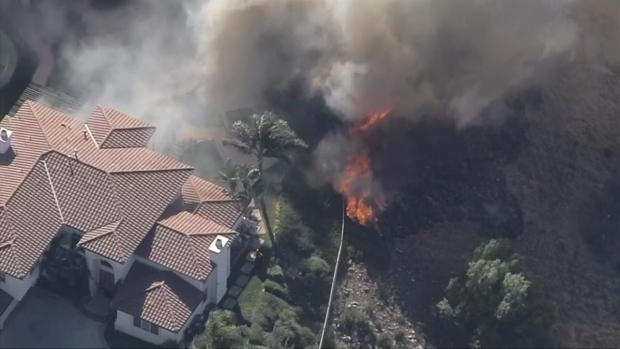 Firefighters worked quickly as flames from a flare-up caused by the massive Woolsey Fire in Southern California approached the yard of a hilltop home in West Hills. Despite the encroaching flames, fire crews were able to knock down the fire and successfully defend the home. Wearing a camouflage "USA" hat, Trump gazed solemnly at the devastation in Paradise. Several burned-out buses and cars were nearby. Trees were burned, their branches bare and twisted. Homes were totally gone; some foundations remained, as did a chimney and, in front of one house, a Mickey Mouse lawn ornament. The fire was reported to have moved through the area at 80 mph. "It's going to work out well, but right now we want to take care of the people that are so badly hurt," Trump said while visiting what remained of the Skyway Villa Mobile Home and RV Park. He noted "there are areas you can't even get to them yet" and the sheer number of people unaccounted for. The president later toured an operation center, met with response commanders and praised the work of firefighters, law enforcement and representatives of the Federal Emergency Management Agency. "They're out there fighting and they're fighting like hell," Trump said of the first responders. He pledged that Washington would do its part by coming to the Golden State's aid and urged the House's Republican leader, Rep. Kevin McCarthy of California, a Trump ally and frequent White House visitor, to "come to the office" to help secure the needed funding. Trump long has struggled to convey empathy to victims of national disasters and tragedies. His first reaction to the fires came in a tweet last week that drew criticism as unnecessarily critical and tone-deaf given the devastation: "There is no reason for these massive, deadly and costly forest fires in California except that forest management is so poor. Billions of dollars are given each year, with so many lives lost, all because of gross mismanagement of the forests." After the negative reaction to that response, Trump shifted gears, expressing words of encouragement to first responders and those of sympathy for hit victims. Nature and humans share blame for the wildfires, but fire scientists are divided as to whether forest management played a major role. Nature provides the dangerous winds that have whipped the fires, the state has been in a drought and human-caused climate change over the long haul is killing and drying the shrubs and trees that provide the fuel. When Trump was asked during an interview set to air on "Fox News Sunday" whether climate change played a role in the number of serious fires, he said "maybe it contributes a little bit. The big problem we have is management." In Northern California, Trump continued to show skepticism about the impact of climate change on wildfires. His grasp of forests was shaky at times, at one point invoking fire prevention efforts in Finland — it has a very different climate than California — as an example for the Golden State to follow. Asked if he thought climate change played a role in the fires, Brown responded: "Yes. Yes. And we'll let science determine this over a longer period of time." A reporter asked if climate change was discussed with the president, but Trump jumped in to say, "We didn't discuss it." A reporter then said, "Well, you obviously disagree on this issue." Trump answered, in part: "Maybe not as different as people think. Is it happening? Things are changing. And I think most importantly we're doing things about. We're gonna make it better. We're going to make it a lot better. And it's gonna happen as quickly as it can possibly happen." 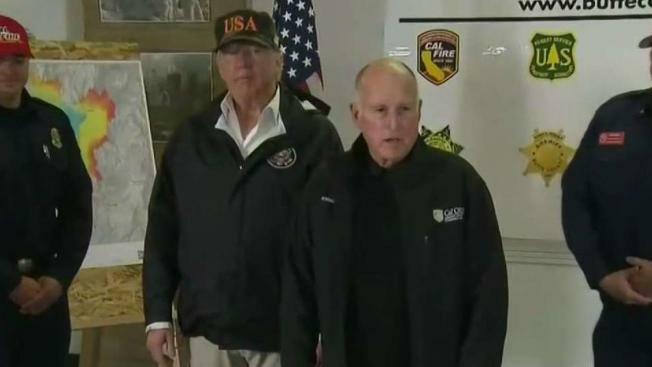 Brown and Newsom said they welcomed the president's visit, with the governor suggesting they set aside political differences since it "now is a time to pull together for the people of California." A fierce advocate of addressing climate change, the governor pointed to several causes and said they need to deal with them. "If you really look at the facts, from a really open point of view, there are a lot of elements to be considered," Brown said. "The president came, he saw and I'm looking forward over the next months and beyond to really understand this threat of fire, the whole matter of drought and all the rest of it. It's not one thing, it's a lot of things and I think that if we just open our minds and look at things we'll get more stuff done."